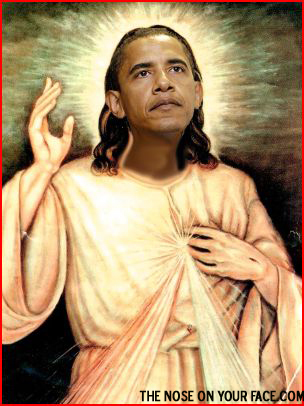 Obama May Finally Succeed! | Watts Up With That? That is a most interesting result. Per capita installed renewable capacity by itself explains 84% of the variation in electricity costs. Not a big surprise given the crazy-high costs of renewables, but it is very useful for another calculation. Currently, we get about 4% of our electricity from wind and solar. He wants to jack it to 28%, meaning we need seven times the installed capacity. Currently we have about 231 kW/capita of installed wind and solar (see Figure 1). So Obama’s plan will require that we have a little less than seven times that, 1537 kW/capita. And assuming that we can extend the relationship we see in Figure 1, this means that the average price of electricity in the US will perforce go up to no less than 43 cents per kilowatt-hour. (This includes the hidden 1.4 cents/kW cost due to the five cents per kilowatt-hour subsidy paid to the solar/wind producers). Since the current average US price of electricity is about 12 cents per kilowatt-hour … that means the true price of electricity is likely to almost quadruple in the next 15 years. And given that President Obama famously predicted that under his energy plan electricity prices would necessarily “skyrocket” … it looks like he finally might actually succeed at something. Since this is being done illegally or at least highly improperly by means of Obama’s Imperial Presidential Fiat, there seems to be little we can do about it except to let your friends and neighbors know that thanks to Obama and the Democratic Party, their electric bill is indeed about to skyrocket … otherwise, Obama is likely to blame it all on President Bush. My Usual Plea: If you disagree with someone, please quote the exact words that you object to. That way we can all understand exactly who and what you are objecting to. Prediction Notes: It is always dangerous to try to predict the future. In this case, we have a couple of issues. First, we don’t know if this relationship will continue to work in the future. And we don’t know if America’s path will be like that of the other countries. The good news is, the fact that there are 19 countries which differ greatly in both installed capacity and level of economic development gives some comfort. Next, outliers. I tested to see whether it would change the trend if I removed Denmark and Germany … it barely changed. That was very encouraging, because it means that the same relationship held when we extended the data from 600 kW/capita (Spain etc.) out to about 1000 kW/capita, a projection of about 60%. Since the extension to the projected US installed capacity/capita (1000 out to 1500 kW/capita) is of about the same size, this increases confidence in the estimate. Finally, we have to make some assumptions about US electricity use in 2030. It will increase … but by how much? Fortunately, the independent variable is installed renewable capacity per capita. This means that extending the line contains a tacit assumption that the electricity consumption will increase at about the same rate as the population. While we have no way to know if this is true, US per capita electricity consumption has been about flat for the last two decades, so it is the most reasonable assumption. Our French loony lefty Royal wants to add 7.000.000 electric points at the side of the road and restrict all autoroutes to 90km/hr. If that doesn’t kill an already poor economy along with the ruinables I don’t know what will. 90 kph is about the speed where drag starts to have significant impact on fuel consumption. FWIW, the US had a national 55mph (88kph) speed limit for several years after the 1973 Arab Oil embargo. The economic impact was minimal. I actually had to drive a car across North America (Washington DC to San Diego) over a long weekend at that time. It took me a few more hours than it might today, but it wasn’t all that onerous. As for electric cars. I live in a cold climate where batteries perform poorly and heating the car cabin with waste heat from an internal combustion engine is welcome most of the year. So I’m not a big fan of pure electric vehicles. But it seems to me that a better solution than roadside chargers might be small trailers with a gas or diesel generator that can be tacked onto electric cars to effectively convert them into hybrids when a trip too long for one battery charge is required. Here in south-east Norway, we have many electric cars, due to insane subsidies. During the winter, which can be rather cold, the car cabins are heated by….. wait for it…. diesel heaters. “But it seems to me that a better solution than roadside chargers might be small trailers with a gas or diesel generator ” And how would converting gas or diesel into electricity with all its technical losses reduce CO2 emissions? That is about 2500miles. At a steady 55, that would be about 45 hrs – 3.2 days of 14 hr driving.. At a steady 80 (some western states speed limit), that would be 31 hours – 2.3 days. Did you count the cost of the extra overnight say ($60-$100)? What about the added cost of trucking merchandise? Not to mention the cost of driving vs. some other, perhaps more lucrative, activity. Some people think time is money. Like everything else ‘best’ and ‘minimal impact’ are determined by requirements. One size does not fit all. You are completely wrong about the 55 speed limit. Many vacation trips which were and are again today 7-10 hr drives became nearly 50% longer once an extra rest stop was factored in. Many families (mine included) opted for air travel instead and a family of 4 consumed fuel at the equivalent of about 5 miles per gallon as opposed to 15-25 mpg. A total green failure, but the number of highway deaths did go down. The only way the electric car will become widespread is when a power distribution system(hot rail or wire) is installed in roadways that allows charging while driving. The limited distance and charging of batteries will prohibit any widespread adaption of the electric vehicle. Wouldn’t I think. But conceptually, You’d only need the generator for an occasional long trip. If you regularly make trips an electric vehicle can’t handle on a single charge you presumably should buy a hybrid or conventional vehicle instead. The only states that allow 80mph at Colorado, Utah and some interstates in Idaho. In most of the US the de facto and de jure speed limit is around 70mph, and in much of it a car with out of state plates is chancing an expensive ticket at any speed over 70. In some places (e.g. NY) less. Largely offset by increased fuel costs at higher speeds? In my experience truckers usually hold themselves to around 65 to 70 mph. BTW, there’s data on average truck speeds on interstates at http://www.statista.com/statistics/195100/average-operating-truck-speed-on-selected-us-interstate-highways/ and http://energy.gov/eere/vehicles/fact-671-april-18-2011-average-truck-speeds You’ll probably be surprised how low the numbers are (pulled down by low speeds in urban areas and bad weather most likely) It’s a few years old, but probably not too inaccurate. How about leaving things as they are until technology actually catches up, I remember an electric car called the Sinclair C5 in GB, we have come a way since then but we need a lot more time to invent a viable system. Stop panicking and get real. Interstate’s 10 and 20 in West Texas are 80 mph as are a few toll roads. The toll road that runs from north of Austin, Tx to San Antonio, Tx is posted at 85 mph. 18-wheeler truck drivers will tell you that driving 55 mph across Texas on I-10 isn’t a long haul — It’s a career! A family of four taking an auto vacation in a 22 mpg SUV is still getting a very respectable and nearly unbeatable 88 passenger miles per gallon. sciguy54, highway deaths did go down, but mostly because of two factors. People were driving less because they couldn’t afford to anymore and because both cars and roads have been getting safer. What really kills, is not speed, but differences in speed. The old double nickel increased the speed difference between the fastest car on the road and the slowest. This ended up killing way more people than the small number saved by the lower speed limit. Great! cannot understand 1 things: why every left wing socialist politician wants to restrict speed limits, they actively and surreptitiously do it in Australia as well! Maybe revenue from speed cameras increase when they lower the limit??? As for electric cars… in order to “save the world” from that cancer called CO2 you want to drag a generator fuelled by fossil fuels!! behind a “world saving vehicle” so that you can charge the batteries and feel good that you are saving Gaia?? The energy conversion doesnt stack up, you might as well do the whole trip on gasoline…. I do a lot of country driving in Oz and you can take it from me a modern car with overdrive uses no more fuel at 70mph than at 60. Like all Regressives, Obama is using the policies of the past to take the country backwards. Do you honestly not see the irony in fossil-fuel powered recharging stations dragged behind already burdened electric cars or is this a joke? In the 1970s when WPE I (worst prez ever, #1) signed the 55 speed limit, the US domestic airline fleet averaged just over 20 passenger miles per gallon of jet fuel. Even the boxiest Elwood Engel monster of that era could easily best 5 highway mpg with 4 passengers, or 10 mpg with 2 up. I just checked the numbers for April 2014-March 2015 and found the Domestic US fleet averaged just under 58 mpg, which is quite an improvement. But to equate the CO2 output with gasoline that must be divided by about 1.15, reducing to just over 50 mpg equivalent. If WPE II were to force a new 55 limit by fiat, then an SUV carrying 4 people would only need to make good 13 vehicle mpg to generate less CO2 per mile than the airline fleet. Easily done. The first electric vehicles were flatbed trucks in New York City around 1906. They got about the same mileage as electric cars get today. For local driving, where some of the fleet of cars or trucks can be charging while the others are out, these can work okay. Of course, they fail in very cold or warm weather. Batteries weaken with lower temperatures and might even have to be heated with their own power to make them perform properly. Batteries also do not like warm weather, which ages them more rapidly and there is the need for A/C. The 55 mph speed limit was not instituted because of “green” concerns, but because of the Arab oil embargo. It was a way to conserve oil during a time of swiftly rising prices and foreign oil dependency that was seen as a national threat. It was repealed when it became clear that threat no longer existed, if it ever did. Referred to (especially in the case of wind generators, where diesel-powered trucks and cranes provide the maintenance and support for the meager electrical output of the system) as “fossil-fuel laundering”. The only glimmer of good news in this disaster is that the next Republican President can use his PEN $ CELLPHONE to 1 reverse this Obama fiat, plus declaw and defang the EPA DICTATORSHIP or until the next bunch of Dimacrats take the rains of power !!!!! It’s only working for O because all the agencies are staffed with progressives and are more than ready to follow his lead. Try throwing it into reverse and you’ll see a lot more hard drive crashes before you see anything slow down. You’d need to gut everything and retool. Problem is that the Republicans often come with a greater moron of a candidate than the Democrats do. Here’s what I don’t get: Does not Denmark get the large majority of its energy from hydro? Yet they still have the highest prices of anyone. I would have thought that all that long-since installed hydro capacity would have helped them keep prices down. No. Denmark has a very high level of wind power. When the wind blows, there is excess supply and it sells the power cheaply to Sweden. When the wind does not blow, it buys energy from Sweden – mostly hydroelectric – at high prices (cunning, those Swedes) to provide for its needs. And at the same time, the once beautiful Danish landscape is now devastated forever. The some goes for Germany. Wind turbines are absolutely hideous. I was in Copenhagen just a few weeks ago. The huge windmills are everywhere. Moose, not forever. Just until the Danes come to their senses and tear those beasts down. Don’t worry Moose – windmills will usually fall over or catch fire with 5 years or so. Apparently, really windy today as they almost were at 100%. Of course, there are other days where there isn’t much going on with the turbines. If memory serves, the energy is shared around Scananavia, between Sweden, Norway, & Denmark. Probably just a tax-raising exercise. Wind power will become a huge economic generator? .When the EU/USA comes to its senses and these worn out alarmist dream towers and large solar farms have become literal rusting relics. That have insulted and Littered some of the most beautiful countryside and landscapes in the world. Then the wholesale removal of these unusable wind monstrosities, will necessitate a FDR’s full employment scheme for all of these hairbrain countries. Millions of men and women tearing down the blades, towers and reclaiming the scrap metal copper and rare earth magnets. The 200 to 500 ton Concrete pads will be dug up and recycled into road beds etc.. Creating a Trucking industry boom. Reclamation of the land, employing millions landscapers, millions of of trees and plants being grown and replanted. Tourism centres and Global warming museums far and wide showing the greatest most expensive folly that mankind has ever embarked on. The occasional tower left on the outskirts of small towns everywhere advertising McDonalds. Base jumpers and wall climber company’s conquering the highest ones. Greenpeace using them as practice banner hanging protest sites . Eagles and hawks nesting on top, Oh the joy. This is not a dream!!!! One of the main factors in European energy prices is the amount of tax levied on the domestic electricity consumers. For instance, the price of electricity in the UK is almost entirely due to the cost of production and supply. VAT (Value Added Tax) is added at only 5%. UK prices therefore seem relatively low. Willis confuses correlation with causation. To the extent that countries that have the political foundation to enact taxes on electricity, they are also likely to force windmills. Is the “without taxes” bar in the chart also without government subsidies? Maybe the countries that force windmills have to enact taxes on electricity to pay for the subsidies. The “price without taxes” is not the price you would pay without the taxes. This is the important economic concept of “Tax Incidence”: part of the tax burden falls on the buyer, part on the seller. But which portion falls on which is the same whether the tax is levied on the seller or the buyer. If most of the tax burden falls on sellers of electricity then Denmark doesn’t actually have cheaper energy than the UK if not for taxes. Just more of the high cost accrues to the government, rather than the actual sellers. 1) Applying these trends to the US seems more than a little problematic because it’s a federal system with a free-market based electrical system. For example, windmills were built in New York state near the finger lakes. However, they could not compete in the market, and were later shut down. 2) The evil of averages comes into play. If one adds an extremely expensive restaurant to a city, the average food costs, as calculated by averaging all food sources, would go up. Does that mean that everyone experiences higher food costs? AndrewL, ultimately, the consumer pays 100% of any tax. businesses are not charitable organizations, they have to make sufficient levels of profit in order to attract investment. Thus when govt taxes cut into profits, they have to find some way to get those profits back up. Either through decreased services or through increased prices. And no, taxing all businesses does not change this equation, because you still need to have enough return on investment to convince people to forgo current consumption. MarkW-Your statement implies some a priori belief about the relative elasiticity of supply and demand in any and all markets. What portion of the burden of a tax falls on the supply side (producers/sellers) and what portion on the demand side (consumers/buyers) depends on the shape of the supply and demand curves for the market. It has nothing to do with producers insisting on a constant rate of profit in the long run. If supply is inelastic compared to demand, the burden will mostly fall on producers/sellers. Please prove your implicit claim that in the long run supply is much more elastic than demand in general. Though, to be clear here, just because a tax falls primarily on sellers/producers doesn’t make it “good.” We are all, in different times and places, both consumers and producers. Taxes make everyone worse off than they would be by decreasing the overall quantity of goods traded. Tax incidence is important however, for comparisons like this, because one cannot just think of the tax as an “addition” to the price, such that we can remove the amount that goes to taxes and get what the price “would be”-we cannot, because the before tax price would be higher without the tax than it is with the tax. The actual “without tax price” is somewhere between where the blue bars top out above and where the yellow bars top out above. Where inbetween depends, again, on the elasticities of supply and demand for energy in this case. Denmark is flat as a pancake, no hydro power. You are thinking of Norway, perhaps. Very different. The only way the Danes and the Dutch could use “hydro” power is using some of the flow from rivers ( In Holland the Rhine, Maas etc. But they would be only effective during the runoff in spring. I am not sure Denmark even has a large enough river to warrant that. And the barge traffic going up rive in Hollandr would stop that anyway. ( just a thought). Denmark is barely above sea level. Just because they’re socialists doesn’t mean they’re entirely ignorant. The rules of supply/demand apply, and there’s a lot of demand for electricity. Or maybe they just set the price way high because there’s no alternative supplier to offer a competing price. The price of electricity includes carbon tax and government taxes in each country. Denmark has very high taxes. The correct way to compare the price of electricity in each country s to strip out all the taxes – but that is difficult to figure out. And of course this article would make no sense if all the taxes were stripped out. This article is a lot of silliness. Correlation does not mean causation in science. Makes the US promise to cut carbon emissions by some ridiculously large amount look impossible. Though there is the probability that the estimated increase in electricity charges will so damage US industry that the emissions will automatically decrease to the required level. Perhaps the POTUS (what an awful acronym) was counting on the destruction of industry to make his promise come true? Just for reference, here in Australia, we’re already on par with Denmark and Germany for household electricity cost. And our ‘progressive’ Labor Party is promising to upscale our electricity sources to 50% wind and solar within the next 15 years (.we don’t have much hydro, and zero nuclear). If any prospective government here was promising to quadruple electricity costs, anyone would reasonably conclude they were not serious about winning government. Yet our Labor party is leading the conservatives 53 / 47 in the polls, with 12 months to the next election. People here just don’t get the kind of info you present here from our MSM. In fact, you guys are a bit of an outlier, so you’re right, you are getting screwed. Willis, with your permission, I will endeavour to post your graph in the comments sections of all relevant articles in our national online media over the coming days. Information is power (no pun intended). Thanks, Mick, go for it and let us know how it turns out. Mick, note the corrected units, the one I posted before has kw/capita. I can definitely say that the cost of electricity is is huge here in Oz, although I do not have a figure to hand. I live in a rural area with no piped water. The cost of pumping it out of the ground is significantly higher than buying it by the tanker. That is insane as our water table is only 10m down. Nobody ANYWHERE gets this sort of info from their MSM. Mick. I have read somewhere that Australia has 2/3 of the known uranium supply. Seems kinda nutty to have “zero nuclear”. Not really, we also have a much easier to use source of coal. That’s where nearly all our electricity comes from. True Jim. But that’s the legacy income our generation will be leaving for future generations, as the world backs away from wind, and sensibly embraces nuclear. Just ask France. “… under his energy plan electricity prices would necessarily “skyrocket” …”. Electricity use is relatively inflexible so the likely result is no appreciable drop in CO2 emissions and what amounts to a savage regressive tax. Thank you for a very interesting scatterplot. It adds to the useful article recently published on wattsupwiththat by Ed Hoskins, in which he showed that, to the end of 2014, the countries of the European Union had invested approximately one trillion euros in large scale renewable energy installations, adding 216 Gigawatts to electricity generating capacity but only 3.8% to actual electricity supply. I would offer a few additional points. The significant increase in electricity prices that results from a high expenditure on renewables is entirely intentional; the goal of climate change-inspired policies is to reduce consumption as much as to add new generation capacity of the politically preferred type. Further, based on the political commitments recently made by the G7 countries, including the U.S., the stated goal is to eliminate all fossil fuel use in the world by 2100 and to make a best effort to reduce it by up to 70% below 2010 levels by 2050. In this context, moving to increase the supply of renewables and to sharply reduce electricity demand by 2030 is merely a first step. The related controversies will go on far longer than the Obama presidency. At CO2 level of 200 ppm plant life stars to shut down. At 150 ppm it shuts down completely. We’re all DEAD!, today’s CO2 level is 400ppm. so, what’s the end game – Al and Eve hunting for berries at the bird beater farm? Why not just eat the birds. The berries could be a side salid. Perhaps using renewables as a percent of installed capacity instead of kw per capita would be a slightly better measure for the scatter graph. Thanks, Guy. Of course I looked at that, hey, I’m a data junkie, so I investigated that along with every other variable I could think of. 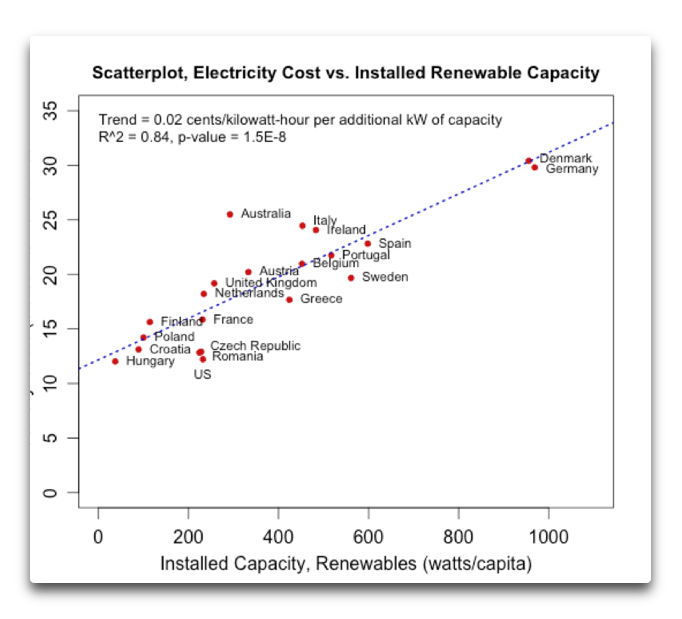 The correlation of installed capacity/capita with price has a value of 0.93, and the correlation of price with renewables as a % of generation is 0.75. And trying it with both those two as independent variables didn’t improve the R^2, so using Occam’s Razor I just used what you see in Figure 1. Willis: Isn’t it actually somewhat worse than you show in your chart? I refer to the fact that you were relating installed capacity/capita: what if it was based on power-factor – which is often taken to be approx 28% of nameplate. My point is, if Obama was insisting on 30% of renewables based on their ‘deliverable’ then the total amount of nameplate wind (say) would have to be a lot more. I was going to make a similar comment as Guy, put with percent of production as independent variable. And here is a follow on question: What effect does the choice of independent variable have on the projected cost? It strikes me that with a small number of data points, the difference between an R^2 of 0.93 and 0.75 may not be significant. Also, you seem to have been sloppy with “percent of electricity” and “percent of capacity”. Very different things. WRT why the correlation of retail price with % renewables as a function of generation capacity is not as good as price with total installed renewable capacity per capita: This may be be telling us the political environment which leads to a high per capita installed capacity is the same political environment (strong influence of Greens) which leads to high taxes on electricity. (A green price ‘synergy’, if you will.) Many developed countries countries like Germany and Denmark generate a relatively large amount of conventional electricity, so as a fraction of total capacity the expensive renewable energy is smaller… but these countries tax the evah-lovin’ bejesus out of electricity used by consumers because, as the European Greens would say, ‘it is the right thing to do for the environment’… and it generates vast additional money for social spending (same a huge taxes on gasoline in these countries). Industry often gets a pass on these taxes; if they had to pay, or it would make then uncompetitive with industries in other countries. The tax support for green energy is only about 0.06 Euro/ KWH in Germany; most of the astounding difference between generation cost and retail price is due to taxes not due to subsidies on renewables. 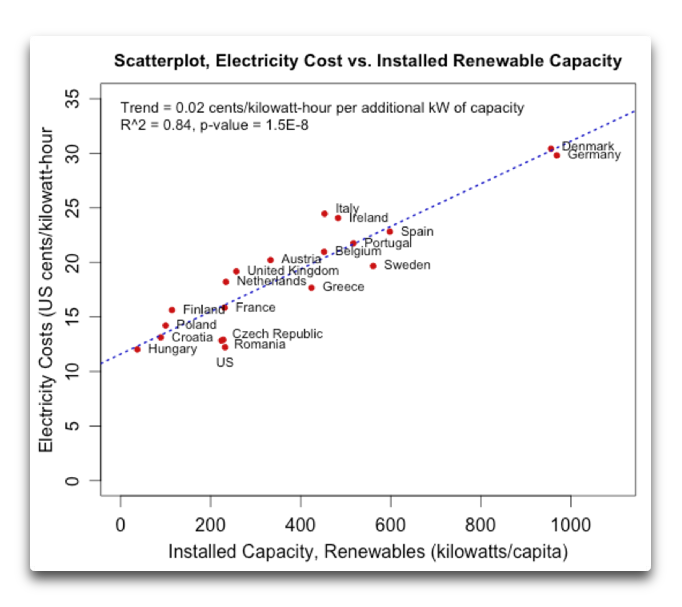 I think the units on the scatter plot should be watts/capita, not kilowatts/capita. Total installed electrical capacity in 2012 in the USA was about 1063 Million KW, or a bit over 3 KW per capita. The fundamental problem with the proposals is that even if fully implemented, and even if CO2 is the driver of warming, they will have a negligible effect on the climate. This is because the US economy in CO2 terms is just too small. Take a look at Wikipedia. In 2013 the US did about 5 billion tonnes out of a global total of 35 billion. The percentage of emissions in 2015 has probably fallen substantially from there. The most the US can do by unilateral action is reduce global emissions by about 10%, assuming other countries do not make up its reductions. Which they quite certainly will. So the question you have to ask is not so much how much this will cost, or whether it will work, but rather, why on earth is the US being asked to do this? Of course, the same thing applies in spades to the UK, which does about one tenth of the emssions of the US, and which, if its emissions were to cease entirely, could have no effect whatever on the temperature of the planet. Nevertheless the crazed green movement, led by the Guardian, wants the UK to ‘tackle global warming’ by reducing its emissions. Admittedly by implementing measures such as burning wood not coal for electricity generation which most likely raise emissions rather than lower them, but there you go. The question to ask all these advocates is: what effect will your proposed measures have on global temperatures? And then ask, tell me again why you want to do this? These genuine and pertinent facts are what “Everyman” should concentrating on. NOT convoluted gobbledygook and pollie-gabble purporting to “prove” CAGW is real..
BTW here in Thailand where I am domiciled, the cost is <13 cents per unit. Not too shabby for a "3 rd World" [sic] country that imports almost all its fuel..
Thailand gets its electricity from (no particular order): Hydro, lignite (mined domestically), and natural gas. Thailand imports oil.. however, it has developed significant off shore gas deposits. The gas has been displacing lignite as fuel of choice for electricity. Great article, as usual Willis. Thank you. I wonder who can do a political piece about the ‘Progressive’ aim, but include the major (big) players as well. The foot-soldiers (Leftie organizations, NGOs, Greenpeace etc) are just in for the ride….but I would like to see who the major players really are. The multi-nationals who are making the wind-turbines and use pressure-groups to ensure constant contracts? The scientist organizing the peer-review? Media colluding to sell news, and make news? It would be a great book…. Wills. As far as I can see, your analysis is spot on. Even though the fuel for renewables is free, the infrastructure costs are so high and so much redundant infrastructure is needed that the effect of “free power” is to push up electricity costs to end users.. This problem can be, and often is, exacerbated by poorly thought out incentive structures that reward wind and solar producers for generating more electricity than users want or can use when conditions allow that. It appears to me that not only is this scheme poorly conceived, it is going to be poorly implemented with the result being a massive transfer of money from residential users who can not shift the cost to someone else to manufacturers who can raise the price of their products/services to cover their increased costs and to utilities who will be allowed to recover their infrastructure costs. A festival corporate looting. Who will benefit? Ultimately, the oligarchs that liberals complain about endlessly. Warren Buffett wins Joe Sixpack loses. What could rescue this chuzzlewitted scheme? Other than a sudden injection of clear thinking — which seems improbable — the only things I can think of would be deployment of low carbon power sources that can deliver a LOT of cheap non or very low carbon power when users want power, or the development of inexpensive, high capacity, electric storage buffers to put between wind/solar generation and end users. Neither seems all that likely. I don’t want to pick on you Don, just make a sort of simple rebuff to the common notion that renewable energy sources are free, while fossil fuels are not. Aren’t fossil fuels free, too? All we have to do is gather them, just like the sun’s rays, all we have to do is gather them, too. I can go walk along the river bank and pick up chunks of coal. True enough,deposits of fossil fuels are found on land which belongs to an owner, but they are free to that owner. Aren’t fossil fuels free, too? Perhaps in parts of 18th Century America. Not in a modern conventional power plant. You have to pay for the fuels to be extracted, perhaps for separation from stuff you can’t or don’t want to burn, and to have the fuel delivered to your plant. 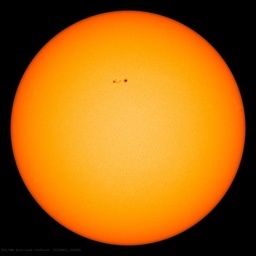 Extracting the usable wavelengths from the entire EM spectrum emitted by the Sun is costly. There is much of the spectrum “you can’t or don’t want to” use, to say nothing of the rejected materials to capture the desired spectrum. Same with wind. There are a number of currents that “you can’t or don’t want to” use, i.e. the wind farm along the Wyoming-Colorado border frequently is shut down during the winter and spring due to high winds. Again very costly. Sad to see the UK so far above the trend line. We always seem to adopt the most inefficient and costly way of achieving our goals, not that we’re likely to to do that either. That’s the price we have to pay for being world leaders in reducing emissions. Thank goodness Obama said last night that the US intends to take over that mantle. How the US will compete with their energy costs significantly higher than today remains to be seen. Presumably he also intends to bring petrol (gas) prices up to European levels. Then US drivers WILL squeal. Actually, he will leave gasoline alone until everything else is in place. If he were to attack that angle first, he would be impeached and never get any of his inane plan through. Even the senate democrats would know that $8/gal gas would doom their electoral chances for a generation. That is why I referenced gasoline separately. The pump price has an immediate highly visual impact on drivers to which they will react. It takes some time though before you realise your home energy costs are a lot higher than previously-probably an entire year. Actually, the method to the (WH) madness is to ignore highway infrastructure and force the states to raise fuel taxes themselves while the federal fund shrinks. You could blame Congress for that, except that was while throwing billions at states to build computer systems for health networks for ObamaCare. They often failed or were not talked about. There is a lot of insight to be gained from the relative silent treatment of this WH in various topic areas. The west seems to me to be intent on committing economic, not to say, social, suicide. Will we wake in time? Indeed – but China isn’t part of the Greenie, Bilderberger ‘World Government’ cabal, and neither I think are India or Indonesia, so it will all be for nothing. History shows us that revolutionaries always get hoisted on their own petard, through an inability to see beyond their own noses. Our ‘leaders’ are wedded to a course which is not supported by the majority, but given the deliberate weakening of democratic accountability in the West in the previous generation or two by the elite (which includes corporate owners and CEOs), I don’t think we shall ‘wake in time’. My dad used to talk about people who just can’t stand success. Looks like they are taking over. In 2014, electricity prices in Belgium were freezed and VAT was reduced to 6%. In 2015 and 2016, prices will skyrocket. * € 56: charge to get rid of the huge debts due to the payment of subsidies for renewables. The charge will be introduced from January 1 2016 on. Total increase of electricity prices in 2015 and 2016 in Belgium: € 256 or 37%! “The rise wille be limited thanks to the current low energy prices” (Flemish Energy Minister Turtelboom has a weird sense of humour). In Belgium, the Flemish government has announced a new tax to eliminate the deficit that was created (by previous governments) by “oversubsidizing” green energy (quoting the Flemish minister of energy). Electricity bills will rise by at least 8%. So they used our (taxpayers) money to subsidize renewables, and now they find out they’ve been spending even more than they could steal, they come back at us (customers) to fill the gap. Isn’t that wonderful? And the best part is : no one ever asked us anything. I was expecting riots in the streets, but the people are waiting for an offensive cartoon or something, I guess. Belgians seem to wait a lot; 589 days between 13 June 2010 and 6 December 2011 without a government! At least politicians can’t be doing anything bad whilst they are talking about forming a government. Do you have a source for that, please? It’s worth repeating elsewhere. PG&E page showing breakdown of electrical supply. Makes it rather obvious that the pursuit of ‘green energy’ is self-flagellation. What do they feel guilty about? Federal assessments of recoverable crude oil and natural gas in the Outer Continental Shelf (OCS) off California indicate a possible 10 billion barrels of crude oil and 16 trillion cubic feet of natural gas. The federal moratorium on oil and gas leasing in OCS waters expired in 2008, but there is a permanent California state moratorium on offshore oil and gas leasing in state waters and any plan for offshore drilling leads to a deafening outcry from harpies that pressures oil companies to explore the Arctic instead. Meanwhile, California’s current natural gas production is diminishing and the state now imports gas from Mexico. About 25% of California’s electricity is imported — from hydro and wind generation in the Pacific Northwest and from hydro and coal generation in the Southwest. A state law limiting financial investment in power plants that don’t meet CA emission requirements has reduced import of coal-generated electricity. In-state, natural gas supplies most of California’s electricity generation. Nuclear provided as much as 20% until the 2013 San Onofre shutdown, now it’s about 10%. Hydro supplies 10–25%, depending on drought conditions. Regarding Californians’ disdain for any offshore oil and gas production…the 1969 Union Oil well blowout helped kick off the Environmental Movement and led Californians to believe that tar balls on beaches all result from oil drilling. But the tar balls actually come from natural seeps that have been flowing for 100,000s of years and, ironically, pumping can reduce the pressure that forces the seepage. Political leaders seems to belive that IPCC are providing robust science and seems unable to grasp that climate change proponents are braking their back to change definitions, add assumptions and provide ad hoc hypothesis to evade falsification. Your clever little test indicate that switch to renewables will add a significant burden on everyone particularly on the poor. This seems unethical to me. Are there no brave political leaders who have the scientific integrity, and cojones, required to suspend action until the climate change theories have survived testing. Climate Otter: Denmark’s highest “mountain” is 147 m high. It is very difficult to extract water power in that kind of Landscape. Don’t forget that the loons in Scotland (the SNP) want 100% renewables. What will that do to electricity prices? Why is Norway not includede in this renewable inatallstions graph? For all practical purposes, Norway is more than 100% self-supported by hydro power, and has a net export to the continent. You will have noticed that Willis expressly excluded hydro in the calculations. He did, and it is interesting. The renewables portion excluding all hydro power explain the price of electricity very well. I rather dislike this terminology; hydro is definitely renewable as joules, although there is not so much available unused watts available. Anyway it shows clearly how renewables are not cheap and how parity with ‘cheap’ coal is far far away. And even though it is hard to see, since Norway is implementing the abundant European Union legislation, as fast as any European Union country – Norway is not part of the European Union, which the graph was about. Good point. Iceland, Norway, Switzerland, Serbia, Albania, Belarus, Ukraine, Russia. There are still plenty of European countries outside the EU. Is this 100% reliance on hydro not a little risky? Suppose Norway got a couple of “drier than normal” years, would be in trouble? There seem to be predictions of a cool climate phase over the next 20-30 years, cooler means less rain and snow in general. Surely it is a better idea to have a mix of power sources? I expect the people of Bergen would be very grateful for a couple of ‘drier than normal years’. Bergen – Total annual Precipitation averages 1958 mm (77.1 inches) which is equivalent to 1958 Litres/m² (48.02 Gallons/ft²). It is most unfortunate that the Political classes cannot read, thge few that can are unable to understand without feeling the money in there pockets! Question, life expectancy of panels ? life expectancy of batteries at a cost of ? billions ? As with most developing technology the question of when to adopt has many answers. For real people spending their own money, some jump to buy everything new, others wait until it matures and prices fall. Others never buy. When governments are spending other peoples’ money it’s easy to buy too early. In this case way too early. The technology adoption lifecycle model describes the adoption or acceptance of a new product or innovation, according to the demographic and psychological characteristics of defined adopter groups. The process of adoption over time is typically illustrated as a classical normal distribution or “bell curve.” The model indicates that the first group of people to use a new product is called “innovators,” followed by “early adopters.” Next come the early and late majority, and the last group to eventually adopt a product are called “laggards”. One problem we have here is justification based on projected costs of global warming — if it saves the world, it’s worth it. In my view this is the most important event that will change perceptions about global warming/climate change in mainstream media and public. At last someone had the guts to say it.This site should have realized this would happen. The lukewarming story will not hold up either! You are off by a factor of 1,000 in your conversion from MW/million head of population. It is equivalent to watts/capita, not to KW/capita. What about Greenland? How much hydro energy you could generate there? How to transmit that energy elsewhere where it is needed? How much will they produce when they freeze over? An how long will that last? The chart is great but the conclusion may be flawed. Correlation does not prove causation. The data also shows that increased energy costs “cause” (provide an incentive for) more renewable capacity. This view of causation is more consistent with the basic economic principal of supply and demand and may provide a more generally useful interpretation of the data. This was my concern as well – just reviewing in case someone else mentioned it. The business case for renewables gets better if your cost of electricity is already high, and thus the argument may work both directions (ie: high costs are correlated with presence of renewables). This is similar to how Ethanol in the US is tied to Oil Prices….it’s the opportunity cost that is impacting the decision. That being said, I think most everyone would agree that Renewables, once subsidies are accounted for, generally drive a higher cost. I just don’t think this chart should be used as an argument without recognizing Steve’s point above. then – renewable energy will asymptotically reach a cost level where force and subsidies are not longer required. Which came first: high energy prices or renewable energy solutions? You know the answer to that, and it implies that Willis’ interpretation is the correct one. “…a more generally useful interpretation of the data.” ??? Maybe a more generally useful interpretation of the data based on ideology, but not a reasonable interpretation of the data. It is true correlation does not prove causation, which is why it is hilarious that CO2 (specifically man-made CO2) is said to cause warming, when historically not even correlation is consistently demonstrated. In this case each country is a discrete entity with it’s own unique set of taxation, economies, other energy sources, demand, consumption, advantages and dis-advantages. Regardless of these differences what they do have in common is higher renewables per capita and higher energy costs. The case could be made better by showing energy costs per capita before the forcing of renewables, however until then the most reasonable interpretation is obvious and pointed out in the article. Thanks for the info. “43 cents per kilowatt-hour.” that is around 20 to 40 times what we were told it would cost. It is without doubt the single most stupid policy that mankind has ever conceived (at least since the dawn of printing). Rather 1 kW/person. 1000 kW would be fairly much. Yes, Norway has 4.8 kW/person hydropower. 95% of all electricity. Figure I ce sont des Watts/capita. Based on 2010 figures US has a total electricity capacity of about 1, 063 000 MW about the same as Europe combined. About 317, 640 MW comes from coal plants . New EPA rules will mean that 32 coal fired power plants will be forced to be shut down and an additional 36 plants might have to close due to new federal air pollution regulations . These shutdowns will further reduce the US capacity by 14,700 MW. There will be very little margin between capacity and demand during peak periods . If Obama wants to have 28% of the electrical energy to come from renewables , it would mean that 75 % of the time there would not be power for of renewable power users (28 % of US ) unless there is full nuclear or fossil fuel back up or ability to purchase from Canada. But Canada has a total capacity of only 135 000,MW, One cannot continue shutting down your dispatchable power generators and increase your intermittent generators without having major sustained black outs . Just look at what Germany is doing and they have been having problems,but they have learned from their mistakes and are trying to fix things . Wow… am I glad I live in Hungary! The ‘government’ here – and I use the term very loosely – conforms to the normal Hungarian behaviour of “If they’re doing that, I’ll do this, because I know best and everyone else is wrong”. Sounds awful, but once you understand that, life in Hungary makes a lot more sense. Just hope they crack on with building a few more brown coal burning plants and a few more reactors, then they can export cheap electricity to the rest of Europe! New Socialism/Linberalism consists essentially in being seen to have your heart in the right place whilst your head is in the clouds and your hand is in someone else’s pocket. Please check the units at the graph. Power is essential. People will simply have to move money spent on other things, to the fuel budget. Here in the UK we already have a phrase “Heat or Eat” for poorer families struggling in winter time. Can you help me out on what the $/kwh actually represent? I just went through a review of my electric bill for my home in Northern New Mexico and compared my actual bill with data published by EIA. As far as I can tell the EIA data for New Mexico reports the $/kwh for the first usage tranche, i.e. the first 450 kwh. Additional usage is charged at at progressively higher rate. In addition the EIA data does not include a bunch of other charges such as: fuel cost adjustments, renewable energy rider, cost effective energy “saving”, state and county taxes. The net result of all this is to take my cost from the EIA number of 9 cents per kwh to 18 cents per kwh. Is the US data and European data developed consistently and are we looking at apples to apples comparisons? Boy do I feel fortunate. I am at 0.08 / KwH (yes 8 cents) and it is all natural gas. Used to be a lot of coal but all the new stuff brought online for the last 10 years is gas and the coal were converted because it was cheaper. I consider anything above 0.15 / KwH to be price gouging. I also consider not counting hydro as cheating. The only place that has ever gone 100% renewable for any length of time was Costa Rica and that was because they counted hydro as renewable (as it should be IMHO). They are unique in that respect. I have a friend living in Costa Rica. His mother now has dementia and tends to leave appliances and lights on 24/7. This is costing him serious problems due the cost of electricity there. Excellent. If a country removes all renewable capacity from its portfolio, then figures out a way to uninstall some 500 kW/capita more, electricity should be free. It may sound a bit tedious to uninstall capacity you do not even have, but I am sure there is a solution to that problem. It should be possible, at least in the EU. Guys in Spain for example managed to generate solar power at night using diesel generators, so there are no limits, really. My electric bill is already skyrocketing. I have written to my State public utility commission to complain. Everybody needs to do this if they feel their artificially skyrocketing fuel bills are causing them financial distress. For those who think they are only paying US$.08 per kilowatt, check your bill closely. In Illinois, we have to pay two separate amounts, one for the infrastructure, the other for electricity. It is all for the electricity in the end. The infrastructure amount often doubles the bill, or more. So .08 is actually .16 per kilowatt. It is smoke and mirrors with this government. According to EIA, US produced 13 % of the 2013 power via renewables . a 30% increase would raise it only to about 16.9 % not 28 % as you suggest. The Clean Power Plan will drive significant new investment in cleaner, more modern and more efficient technologies, creating tens of thousands of jobs. Under the Clean Power Plan, by 2030, renewables will account for 28 percent of our capacity, up from 22 percent in the proposed rule. I had to work off of the “preview” information on the plan. It looks like it’s not as bad as I thought. Instead of requiring 30% of power generated, he’s only demanding 30% of capacity. However, this is not as easy an out as it seems. This is because the US average capacity factor is 0.29 while the average wind capacity factor is about 0.24, so calculating it as a percentage of capacity doesn’t help much. Thanks for the clarification. I have modified my past comments as a result..
Strangely enough, it is not about energy, nor any science except political. Goal one: get power. Goal two: keep same. Create shortages, then subsidies. The subsidized will support you else the subsidies be reduced. Works until the productive economy becomes too small to support the parasites. High energy prices do not hurt the poor. They require the “poor’ to get energy subsidies. Like food shortages in the worlds most productive agricultural economy. Or farm subsidies in the same economy Or housing shortages in the country with the most housing per capita in the world. Or trouble finding a doctor in the country with the worlds biggest medical establishment. Or transportation shortages and subsidized mass transit in the country with the most cars per capita. Producing too much of something cheaply require the government to screw up the production so as to create a rationable resource. So if Uber creates too much inexpensive and efficient transportation….. The higher the energy costs, the less competitive your economy will become. It is economic suicide to drive your electricity/energy costs ever higher. In the long-run, the country’s standard of living will be reduced in proportion to the cost of energy. We should be using every possible source of Hydro available. Not only does it produce clean, reliable, low-cost power, but the dams create beautiful lakes that are a huge benefit to nature and humans. The only issue with Hydro is the energy loss on long transmission lines. The new efficient combined cycle natural gas power plants are the second choice. Not only are they highly efficient and low CO2 producers, we now know there are huge resources of natural gas available from the new fracking technology that can be accessed virtually everywhere in the entire world. Gas is everywhere. It will remain cheap for a long, long time. Fracking is really not the answer. I have Native American friends in North Dakota who are detailing all the problems with the resulting noxious waste water, on top of the endless oil spills in their territories. Waste water and its disposal is also causing huge problems in Oklahoma – google ‘Oklahoma man-made earthquakes’ and many sites will come up – this is one, and shows incidentally that Govt interference in scientific research is not limited to climate disciplines! Presidential candidates should run with this; voters need to know about the planned skyrocketing electricity prices. The sad thing about Presidential candidates is that they don’t get into anything useful in debate or message consideration. That includes lack of concern for the dysfunction of federal agencies mixed with directed misuse by the political appointees. The campaigns look more like beauty contests with no depth of discussion or focus, beyond current events. I can not see how we can avoid a N.A. grid collapse. Without sufficient backup generation and grid fortification, we are in big do-do. Individual states will have to disconnect from the grid AND/OR fight another civil war. Government has become the greatest threat to continued prosperity and nationhood. It is all part of the grand socialist/communist plan. The more poor people you have the easier it is to get socialists/communists elected. I submit that the graph is largely a result of early adopter costs and misapplication of energy policy. Germany installed solar when it was a lot more costly and a significant amount is in even more costly rooftop applications. The installation of wind offshore has got to cost more over time with maintenance costs considered, unless they believe they have perpetual motion machines. The world is so dirty and mean. CO2 is what makes the world green. Dark clouds may have silver linings. Understanding that our high technology infrastructure grows ever more fragile to destruction and vulnerable to: nuclear weapons proliferation, large asteroid/comet impact, massive explosive volcanic eruption, new virulent and fatal plagues, bio-engineered toxic organisms used for terrorism, multiple EMP attacks or huge CME…etc. — reserving easily accessible coal for a civilization that gets knocked back to the steam age is not a bad thing. By the same logic we should mandate that 28% of all farming should be organic. Skills will be in place to feed a small portion of the population should civilization ever get knocked back to the steam age. Thank god we still train our children to ride bicycles! We need universal gun training and every family should have several weapons and large stocks of ammunition. Families should be required to obtain 28% of their meat from hunting. No one to blame but ourselves for voting this person in to be president, not once but twice. Can we undo the damage, possibly. But it will take great resolve and commitment. Both seem to be in short supply. Talk to everyone you know about the stupidity of this plan and its great costs to them personally. Thank you Willis for presenting the costs to this foolishness. Said it before, I’ll say it again. The correlation between the population increase and the increase in carbon dioxide is very good. Since the globalists are interested in reducing population more than carbon dioxide, making energy too expensive to advance the poorer nations as well as reducing the land used to produce food by converting to biofuel support has become the chosen “tool” to “rid the world of useless eaters.” The “green” intent has always been to push human population to something under a billion. Think about it. I would say that Wall Street activists (no, the white suits), may push really hard to get this. The mention of First Solar blows my mind as it is the former First Wind’s affiliate. Not a bad piece of business for a niche, i.e. thin film technology. To put that figure (3.87 cents per kWh) in perspective, if a carbon tax were initiated at $30 per tonne (At that price, the world’s annual CO2 output would be priced at $1 trillion – approximately 35 billion tonnes x $30 — and it is hard to see how Wall Street could resist getting in on the action), a coal power plant, which emits almost 1 metric ton of CO2 per megawatt-hour, would have the same cost just for carbon as the entire “all-in” cost for PV. The coal plant also has to constantly pay for fuel. (Though, to be fair, the NV Energy price takes advantage of the 30 percent Investment Tax Credit (ITC). The ACWA project in Dubai, as mentioned, does not). You don’t have to be a rocket scientist to work out that heavily taxing one form of energy production whilst subsidizing another will lead to a distortion of the market. That excludes LA and Sacramento. Right now (8:46am), renewables are contributing about 8,000MW out of 29,000 MW of demand. At peak, it looks like it will be about 6,000MW (wind will decline a lot) out of 39,000MW of demand. Yesterday renewables supplied 145,000 MWH out of 688,000 MWH of total demand. My electricity cost is $0.14/kwh for the electricity, and $0.03/kwh for the grid connection. I live in San Diego Co. which is one of the best counties for solar power (lots of sun, lots of undeveloped ground with little vegetation). Don’t look at me. I didn’t vote for him. I have been estimating for years that the crash program of green-gadget energy doodads would triple the price of electric power. This was based on the brutally simple math of installed cost/MWh and capacity factor. I finally gave up blogging about it since I’m a world class nobody, and sites like WUWT do it so much better. But it’s still true. As an engineer in the power industry, only cringe at what these crackpot energy schemes will do to the country — not just my employment, but the whole economy as well. Only a bunch of lawyers who never held real jobs in the production economy could believe civilization is being improved with this. And the poor got a whole lot lot poorer during those chaotic years, due their inability to govern. There ain’t enough private savings to accomplish this by 2028. We cannot finance it via the FED buying bonds of the “power companies” assigned the projects…er I mean the power companies that win the competitive bids… without losing an economy destroying inflation. There isn’t enough undeveloped hydro to fill the bill, and the environmentalists would never allow it anyway. The environmental costs of producing 28% of delivered energy with renewables like wind and solar, with their capacity factors of about one-sixth, would be enormous. If “Don K” likes to drive at 55mph that is his business, but I recall long trips in the West at that speed and I want nothing to do with it again. An interstate speed limit of 55 mph is a productivity killer. Period. Especially nowadays with so much inventory being kept on 18 wheels on highways. You were right the first time…. True. When Eisenhower created the interstate transportation system in the 1950s, he used public money—”government-created money” that Congress approves in session—paid to private sector vendors. That’s how the federal government creates jobs. The vendors have to hire people. Since Obama and this Secretary of the Treasury, Jacob Lew—one of the architects of the 2008 Financial Crisis, unbeknownst to everyone—have no clue it works this way. We cannot finance it via the FED buying bonds of the “power companies” assigned the projects…er I mean the power companies that win the competitive bids… without losing [loosening, creating] an economy destroying inflation. Not true. The Federal Reserve never “finances” public works. Not ever. All federal government spending must be approved by Congress, and the US Treasury tells its banker, the Federal Reserve, to mark up its General Account in that amount with keystrokes. The Fed only buys corporate bonds or (people’s or institutions’) treasury securities on the open market when it wants to control the amount of money swilling around in the real economy. Buying them reduces the amount of money available in the real economy. That’s how the Fed controls the interest rate, and inflation. The market doesn’t control the interest rate no matter what the bubbleheads on TV or know-nothing Congressmen claim. All interest profits made by holding those corporate bonds or treasury securities are returned annually to the creator of the currency, the US Treasury, effectively ‘destroying’ the money (the US Treasury makes more with keystrokes). In 2012, the Fed returned $100 billion in interest profits. When there is more money swilling around in the real economy, strong consumer demand for goods and services can help drive inflation. That’s because if there is a limited number of goods or services in the market, but a large demand for them, prices increase. We recapitalized the banks via the mechanism I described–the FED buying bad assets. I am simply explaining why the same mechanism could not be used to finance projects for which there is insufficient private savings with creating very destructive inflation. Willis, an interesting post. To see if the U.S. is really going down that road it may help to do the same analysis by state, comparing US states in the same way EU countries are compared. I suspect that states with the highest average incomes will have the highest electricity rates and the most renewable energy. It’s a folly of the rich, this green energy stuff, nothing more. Further to my previous point it looks like Serbia is the most efficient EU country at adding capacity without increasing costs. The less money you have the further your renewable energy investment goes. The data for the price of electricity given in this report is misleading. The First column is the industrial cost, and the second column is the household cost. I think someone has been fiddling with the data!!! Let us not forget that the first Gigawatts of renewable power generation are put in the best places. There are only [so many] GW you can install in NW Texas and Kansas. So the 100th GW installed isn’t going to be a profitable as the 1st GW. Obama may finally secede? Please, no war between the States to stop him. Thanks for the thought, Mike, but QUOTE WHAT YOU ARE TALKING ABOUT!! I’m not going hunting for anything. If you think something is wrong, stop dancing around it about it and POINT IT OUT!! Quote where I used one, and where I used the other, and TELL US WHY IT IS WRONG!! Is that too difficult? Because if so, please find another person to bother. If the 4% means capacity, combining that with the 231 kW/capita gives about 6 kW/capita for total capacity. I think that is about 3 times actual capacity, so it looks as if the 4% is what it sounds like: percent of production. I suppose you could argue that 7 times the production requires 7 times the capacity, but at least with wind people are getting better and better at picking sites to maximize capacity factor. The following is from 2 years ago regarding the BLS (Bureau of Labor Standards). On March 1, 2013, President Obama ordered into effect the across-the-board spending cuts (commonly referred to as sequestration) required by the Balanced Budget and Emergency Deficit Control Act, as amended. Under the order, the Bureau of Labor Statistics (BLS) must cut its current budget by more than $30 million, 5 percent of the current 2013 appropriation, by September 30, 2013. In order to help achieve these savings and protect core programs, the BLS will eliminate two programs, including Mass Layoff Statistics, and all “measuring green jobs” products. The final release of Mass Layoffs Statistics data will be the publication of the May 2013 data. You mention job losses because of cheap oil and gas, but there is another side of the story, with lower energy costs there is a gain for small businesses and manufacturers. I would like to see the jobs gained by cheaper energy. I would say it’s more than a wash, but I have to admit I don’t have the figures. Also, in Europe, has the price of fuel come down because of low retail prices, or does it remain artificially high? (fuel oil and gasoline)? Some states have cashed in on low gas prices by raising gas taxes. With many oil/gas concerns going under due to low prices, there will be a new round of loan defaults from mortgages/credit and business loans. There will also be a shortfall of other tax revenue of which will require more BAILOUTS. That in turn results in more heavy taxation that can not be afforded due to the precious revenue stream interruption and more towns and cities will go under accordingly. No amount of financial engineering can stop this IMHO as those methods have been exhausted. We now live in a world of of manipulated markets and line toting PR firms. You might want to check this out on a daily basis. Looking at that chart O’s plan plots the US trajectory into a similar position to where Greece finds itself now on that chart… industry-less… and bankrupt! But analyzing his moves, that has been his plan all along has it not? My concern is not only about the quadrupling of the cost of electricity , but the reliability of the future 2030 grid with almost 340,000 MW plus some of intermittent power spread all over the nation. Obama has washed his hands of any future responsibility by saying that the power producers and grid operators have to solve the problems. However, he is making the final decision and has overall accountability for the problems that may arise,. In my opinion,in the end, the consumers will have a much less reliable electrical system with more frequent power outages , 4 times higher electrical costs at least and with no detectable impact on climate which really cycles every 60 years and is now heading for cooler weather rather than warming . We may be leaving a mess for our future generations , not helping ve the problem s. In the end, the consumers will have a much less reliable electrical system, more frequent power outages , and 4 times higher electrical costs will no detectable impact on climate . I am shore your view based om energy prices per head population per country is correct but when I look at Germany where I live the reality is quite a different picture. Germany has invested over 100 trillion euro in solar alone. Because most countries but especially Germany protect their power intensive industry from price hikes the have decided to trade power at an exchange. It could very well be that the energy traded at the exchange has gone down in 2013 but not for the consumer, the avaerage family. On top of their electricity bill they have to pay a consumer charge which will go increase even if the power traded on the exchange goes down. at the same time the “Energiewende” completely detroying big utilities like RWE because they have the obligation to keep massive back up power in the air which comes at the same costs as 24/7 base load production. This is part of the general plan to create one big European Power Consortium and at the same time destroy the Middle Class in order to tear down the consumer society. In Germany alone we have over 1 million families (not persons) who are no longer able to pay their power bills. Statistics and the reality of the day make a difference between day and night here. This is the biggest con in history. Renewables almost bankrupted the Spanisch State and the highly prized Danish Windpark has been sold. Two weeks ago I drove from the Ruhrgebiet to Bavaria and all along the Autobahn I saw solar parks but they were not maintained because they were covered by plants and grasses. Nobody cares about the exploitation of these parks. They were subsidy hogs serving the banks and the project initiators and the suppliers and for nobody else. Just for the record, 100 billion euro to cover 6% of the total power use in Germany is a joke and the bill will be paid by the tax payer and the consumer via their utility bills. Have a read at this report from the Frauenhofer Institute http://www.ise.fraunhofer.de/en/publications/veroeffentlichungen-pdf-dateien-en/studien-und-konzeptpapiere/recent-facts-about-photovoltaics-in-germany.pdf which is specialized in research of solar, thermal systems and batteries. Of course they have a vested interest in this business so they sketch a colorful future but they also explain how all the pieces of the energy puzzle fit. In the meantime solar projects have crashed in Germany and they are behind on their targets. Looking at energy prices per head of the population IMO is just like watching the summer ice melt and claim that it is caused by climate change. 100 trillion Euro’s for Germany’s total renewable budgets? Can’t be. In the scatter plot you have France at about 16% produced by renewables, but I think this is renewables including hydro, with the breakdown of this total about 76 / 24 % in favour of hydro, which in turn means that wind and solar are less than 4% of total electricity production. But I am definitely not a numbers person, so I may well have got it wrong. does the wording on the scatter plot need changing to match the units? Here is another way of looking at the European experience and what we can expect in the US in which I provide references and data but not the graphics because I don’t know how. US EIA graphs the change in average residential electricity prices in Europe and the United States from 2006 to 2013 at http://www.eia.gov/todayinenergy/detail.cfm?id=18851# . The key takeaway is that it has increased by over 40%. The European Environmental Agency published a summary of trends and projections in Europe in October 2014. Figure 5.5 in http://www.eea.europa.eu/publications/trends-and-projections-in-europe-2014 includes the trend of renewable energy in the European Union using the renewable energy source share of gross energy consumption. I digitized data from the graphs and converted the Renewable Energy increase to a percentage as shown below. This comparison shows that since 2006 EU electricity prices have clearly increased at the same time that the EU renewable energy source share in gross final energy consumption has increased. But when you look at figure 1 you find that the US is placed at 231 watts per head, not kW/head. Forget all the extra units – they only confuse. Roger, perhaps you could space out your table so that we can see what is happening. Put a table through word and it removes the separation into discrete columns. You have to add either tabs or spaces to get things roughly correctly aligned so it is readable. This especially applies to headings of more than one line which just get completely mangled. The last time I checked the cost to manufacture in the US was down to about 105% of the cost in China, virtual parity. This was due in no small part to low energy costs. It would appear that the current administration would rather increase the minimum wage for burger flippers than provide real living wage jobs in the manufacturing sector. Curious why people are even trying to compare Denmark’s use of ruinables (love that) versus the U.S.? Denmark is only 1/4th the size of North Dakota and has a population of, what? 5.6 million? We would need now many millions of bird choppers to equal them? relatively speaking of course…. I appologize — when charts, liberals and such use Denmark and other miniscule countries in comparison to the U.S. I have to giggle. This graph is silly. Its like showing that a dog tail wags the dog. Renewable energy is NOT setting the cost of electricity in these countries. In science we know that correlation is not necessarily causation. What sets the cost of electricity in a country that uses fossil fuels for over 50% of it electricity? Cost of electricity is set by fossil fuel prices and regulatory agencies. Carbon tax is part of the reason for increased cost of electricity. The EU countries with high electrical costs have carbon tax, USA does not have carbon tax. According to your link Sweden has the highest CO2 tax, but the chart shows Sweden well below the the trend line. And to the extent that a CO2 tax is diverted to fund renewables, the force of your objection is further weakened. Do you deny that renewables are expensive or that they raise the cost of energy? And the truth is good correlation always implies some causation to be discovered–only spurious, accidental correlation doesn’t. But we have both fair correlation and likely causation. What factors are involved? 1) Not all renewables cost the same. 2) Not all penalties go to funding renewables. 3) Not all subsidies come from energy fees; some come from general tax funds. Sweden gets almost all its power from Hydro 50% and Nuclear 30%. Sweden has only about 10% from other Renewable. The silly graph in WUWT is wrong for not showing Hydro and Renewables as a combination. Hydro is a renewable source of power. Also Sweden’s Hydro and Nuclear plants are old and amortized, so their only costs are operations, maintenance and fuel. That is why electrical costs are low in Sweden. Renewables are not that expensive. Government taxes unrelated to power generation have a big impact on electricity costs. You tell some whoopers! England’s energy costs less than Germany according to the silly graph. England has less renewables than Germany, Denmark and Sweden. Wind is cheaper than nuclear and coal. The combination of wind turbines and natural gas CCGT is more efficient and costs less than either coal or nuclear at generating energy 24/7 and load following. Nuclear plants do not load follow in the US and very little anywhere else in the world. Wind is cheaper than nuclear and coal. The combination of wind turbines and natural gas CCGT is more efficient and costs less than either coal or nuclear at generating energy 24/7 and load following. …where it’s not worth controlling the weeds to let a little sunlight in. The graph is silly because scientifically correlation does not mean causation as I said before. Germany is a great manufacturer, even better than England. If nuclear power is so great economically, then why are nuclear plants shutting down and new ones being scraped? Because the price of natural gas has plummeted. As for correlation, it has been noted that when the wind does not blow the windmills do not turn. This has led many to suppose a causal relationship between the two. As a mechanical engineer and nuclear engineer who worked for over 35 years on the design, construction and operation of fossil, renewable and nuclear power plants. I know more than you think. But based on your statements, I realize that you are not a power plant engineer and do not understand the subject very well. Solar can generate all the electricity a properly designed home needs including heat by day and by night with battery backup. Of course I am discussing California, not Maine or Alaska. Solar can generate all the electricity a properly designed home needs including heat by day and by night with battery backup. Of course I am discussing California, not Maine or Alaska. Mmmm … so you agree that solar is not enough to power your usual house, it needs to be “properly designed”, like say Amory Lovin’s house. And you also agree that there are many parts of the world like Alaska and Maine where solar won’t work. You also agree that every house so equipped will require a double fistful of expensive batteries for backup. And since I’ve lived off the grid, I can assure you that such a house will also need a backup source of power (the grid, or a generator). Finally, you haven’t said it but I assume you know that at present, by and large solar is totally uneconomical without subsidies, either for for grid-sized systems or house-sized systems. So while you may be very knowledgeable about power plants, I’m not at all clear what your point is about solar. If nuclear power is so great economically, then why are nuclear plants shutting down and new ones being scrap[p]ed? As a nuclear engineer, surely you know the huge pressures that are being put on the US nuclear industry. However, in the rest of the planet there are about sixty power reactors under construction. So while you may think they are uneconomical … I fear the world disagrees with you. All of the data below is verifiable through links at Current and Future Generation/Plans For New Reactors Worldwide. In all, over 60 power reactors with a total net capacity of some 186,000 MWe are planned and over 300 more are proposed. Energy security concerns and greenhouse constraints on coal have combined with basic economics to put nuclear power back on the agenda for projected new capacity in many countries. In Finland, construction is now under way on a fifth, very large reactor which is expected to come on line in 2017, and plans are firming for another large one to follow it. France is building a similar 1600 MWe unit at Flamanville, for operation from 2016, and a second may follow it at Penly. Romania’s second power reactor istarted up in 2007, and plans are being implemented for two further Canadian units to be built. South Korea plans to bring a further further four reactors into operation by 2018, and another eight by about 2030, giving total new capacity of 17,200 MWe. All of these are the Advanced PWRs of 1400 MWe. These APR-1400 designs have evolved from a US design which has US NRC design certification, and four been sold to the UAE. In China, now with 26 operating reactors on the mainland, the country is well into the next phase of its nuclear power program. Some 24 reactors are under construction, including the world’s first Westinghouse AP1000 units, and a demonstration high-temperature gas-cooled reactor plant. Many more units are planned, including two largely indigenous designs – the Hualong One and CAP1400. China aims to more than double its nuclear capacity by 2020. I agree solar is not yet developed enough for stand alone service in cold and northern latitudes and batteries are expensive. IMO solar, wind, batteries and efficient use of electricity in the next 10 years will change the mathematics of renewable energy. 1. The nuclear plants currently being built in Finland and France are years behind schedule and costing triple the fixed price agreed upon. Not economical and the French reactor builder Areva is going bankrupt. 2. The nuclear plants in construction in Georgia and South Carolina are years behind schedule and hundreds of millions of dollars over budget with many construction quality problems. The Watts Bar Unit 2 is an old plant that was in mothballs for years and is now being finished. No other nuclear plants will go forward in the next 5 years and maybe much longer in the US. Several old nuclear plants may shutdown in the next 5 years in the US. 3. Chinese are building some nuclear plants, but compared to their building of wind, solar and hydro the nuclear is peanuts. The same is true in India, they are building more wind, solar and hydro than nuclear. 4. The ones and twos in the many of the other countries will never proceed. Nuclear power is being out performed in cost and schedule by natural gas CCGT and wind turbines. You should read the latest report from Department of Energy showing that wind energy is beating even natural gas CCGT in cost per KWH in some areas of the US. Mainland China has 26 nuclear power reactors in operation, 25 under construction, and more about to start construction. Additional reactors are planned, including some of the world’s most advanced, to give more than a three-fold increase in nuclear capacity to at least 58 GWe by 2020-21, then some 150 GWe by 2030, and much more by 2050. Are you truly claiming that China is doing all of that knowing that they will lose money because jaagu says they are uneconomical? Look, jaagu, if you want respect around here, changing the goalposts when your claims are shown to be false won’t do it. Admit you were wrong and move on. You do not reference where you g0t this wild and unrealistic forecast for China: “150 GWe by 2030, and much more by 2050”. That means 150 reactors in 15 years. Your source must be the nuclear industry, not any agency or entity that looks at realistic forecasts. designed, constructed and operated by the government and financed by the government. They do not need to have the same strict licensing and environmental regulations as in the OECD countries. So no one can compare the cost of China’s nuclear power plants to OECD nuclear power plants. It is like comparing water melons to tangerines. Looking ahead, the shares of nuclear and hydro continue to decline, but the scaling up of renewables is sufficient to lift the aggregate non-fossil share from 32% in 2013 to 38% by 2035. Within the OECD, renewables dominate the growth of non-fossil power, and contribute 90% of the net growth in power generation from all sources. The growth of non-fossil fuels in the non-OECD is broader based. The increase in renewable power is roughly the same in volume terms as in the OECD. But there are also significant increases in nuclear and hydro. Renewables account for 16% of the growth in power generation in the non-OECD. Despite losing share in the global power sector, nuclear and hydro are still expected to grow by 1.8% p.a. and 1.7% p.a. over the Outlook. Nuclear capacity in Europe and North America declines as ageing plants are gradually decommissioned, and the difficult economics and politics of nuclear energy stunts new growth. Japan is assumed to restart its reactors gradually from 2015 but is not expected to recover to pre-Fukushima level of nuclear power generation by 2035. Global hydro growth is also driven by the non-OECD, with China and Brazil projected to grow by 450 TWh (1.4% p.a.) and 250 TWh (1.9% p.a.) respectively. Africa is the fastest growing region at 3.8% p.a., adding 150 TWh over the period. It has abundant motives due to the appalling pollution problems it has created in over three decades of unbridled economic growth. (These problems are reviewed in telling detail in the YouTube video “Under the Dome” by Chinese journalist Chai Jing). I hope these points help you to see that the economics of nuclear power is what is holding back the industry. With regard to moving goal posts – I see no point in your comment. My comment was directed at nuclear power plants in the US as noted by my examples. I welcome more discussion on the economics of nuclear power. Demand for all fossil fuels expands with oil (+67%), gas (+270%) and coal (+21%) covering 66% of demand growth. Renewables in power (+580%), nuclear (+910%) and hydro (+50%) also grow strongly. Do you see which one of those shows the greatest growth? Nuclear. Energy consumed in power generation rises by 81% and while coal remains the dominant fuel source, its market share drops from 77% today to 58% in 2035 as renewables (up from 3% to 13%) and nuclear (up from 2% to 11%) gain share. So let’s see where their numbers lead us. Total electrical generation in China in 2013 was 5361.6 TWh/year, of which 110.6 TWh/year was nuclear (BP figures for those). This agrees with 2% nuclear figure given in your citation. By 2035 an increase of 81% means China will be generating 9705 TWh/year of energy. If the nuclear share goes up to 11%, the nukes will be putting out 1067 TWh/year of electricity. And to generate 1067 TWh/year of nuclear electricity figuring a 90% capacity factor means that by 2035 they will need 135 GWe of nuclear generating capacity, per your figures. Now, recall that the other source I quoted said 150 GWe by 2030, which you heaped scorn on … but your own citation says 135 GWe by 2035, which is most assuredly of the same magnitude. Given that these are two different forecasts of one of the more enigmatic parts of the world, those are quite close. So save your sneering about how my source is the “nuclear industry”, it just exacerbates the fact that you didn’t do your homework. Next time, jaangu, run the numbers before trying them out on me. I assure you, handwaving doesn’t often work with me. I’m not impressed by anything until I actually run the numbers and do the calculations myself, and understand them thoroughly. You forgot that China already has nuclear plants generating electricity. You need to subtract those and get your new correct number. China currently has 28 operating reactors and 24 in construction. To me as a nuclear engineering manager the difference between 4 and 10 reactors per year is significant. China has not yet achieved 10 reactors per year and you claim they will do it. That is wishful thinking. You have also totally ignored my discussion about the economics of nuclear power in China and else where. You have done a lot of hand-waving arguments that nuclear power is economical and that I do not know the economics of nuclear power. But you present no facts or references that nuclear power is economical. I blew your hand-waving ideas about Chinese nuclear power economics out the window. So no, I don’t “need to subtract those [existing plants] and get your new correct number”. The number I quoted clearly refers to an increase in total nuclear capacity TO at least 58 GWe, and not an increase in nuclear capacity OF 58 GWe. As a result, the numbers I calculated were for total nuclear capacity, and need no adjustment. The figures I originally quoted said 150GWe total nuclear capacity. The BP figures said 135 GWe total nuclear capacity … I call that close, for a couple of guesses at what a bunch of inscrutable Chinese might do in a couple decades. As to the economics, nuclear plants are being built (as I have cited and discussed) all over the world. Your claim that all of those countries, from France to Belarus, from Pakistan to India, from Poland to China, are all building expensive power plants knowing that they are uneconomical, that is a joke. People don’t do that. PS—You say “BP numbers: 80 reactors in 20 years = 4 reactors per year”. I don’t understand this. I didn’t see anywhere that BP gave numbers of reactors, just amounts of GWe. A link to your source for that would be good. Also, I believe you are using your incorrect figures. Again, I find nothing in what I quoted about “150 reactors in 15 years”. Instead, it says China will have a TOTAL nuclear capacity of 150 GWe in 15 years … but it says nothing about numbers of reactors. The new Chinese reactors are almost all either 1.25 or 1.5 or 1.7 GWe, so I don’t know how you got numbers of reactors. In any case, your use of the incorrect figures renders your comparison meaningless. You say “BP numbers: 80 reactors in 20 years = 4 reactors per year”. I don’t understand this. I didn’t see anywhere that BP gave numbers of reactors, just amounts of GWe. A link to your source for that would be good. Also, I believe you are using your incorrect figures. BP says: Global nuclear growth is driven by China with an estimated growth rate of 11% p.a. – adding over 1000 TWh by 2035. This is an ambitious target, roughly equivalent to completing a new 1 GW reactor every 3 months for the next two decades. To me that means 20 years x 4 reactors/year = 80 reactors by 2035. I think they are assuming a capacity factor of 80-90%. With regard to nuclear economics we can agree that nuclear power is cost competitive with other forms of electricity generation, except where there is direct access to low-cost fossil fuels and renewable energy. 1. Fuel costs for nuclear plants are a minor proportion of total generating costs, though capital costs are greater than those for coal-fired plants and much greater than those for natural gas-fired plants. 2. Nuclear power plant construction is typical of large infrastructure projects around the world, whose costs and delivery challenges tend to be under-estimated. Poland, United Kingdom, Sweden, Spain, Italy, Mexico, South Africa, Egypt, Israel, Iran and many other countries are not building any nuclear reactors. Some may have plans, but nothing is firm. Thus nuclear power is not a major investment for any of these countries when compare to their total installed electrical generation capacity. But yes some countries may build expensive nuclear reactors because they have not other cheaper alternatives or they want to diversify or they want more energy independence. But their small new build of nuclear shows economics are against nuclear power. Many old nuclear reactors will be permanently shutdown in the next 5 to 10 years in USA, Germany, Belgium, Switzerland, Sweden and France. Japan has permanently shutdown ~ 10 reactors after Fukushima accident and more will be shutdown permanently.